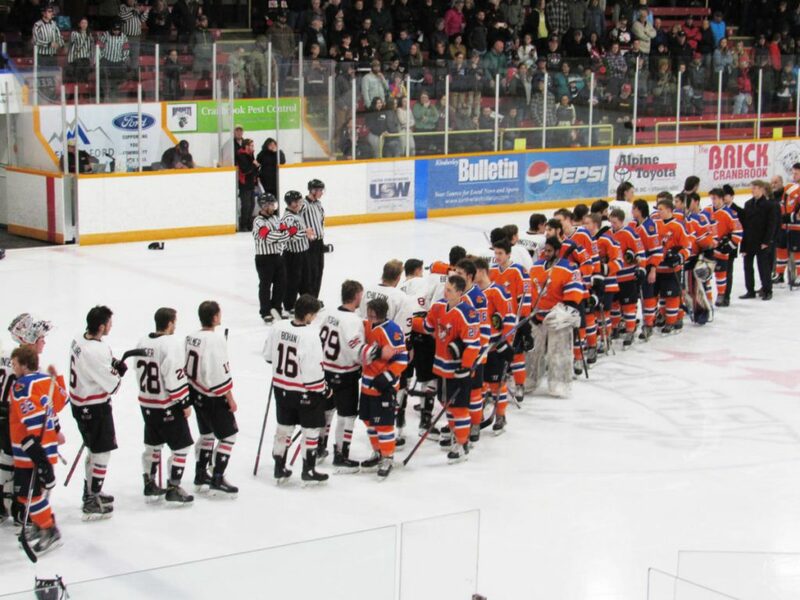 The Beaver Valley Nitehawks hadn’t beaten the Nelson Leafs in six regular-season games, but turns out, that doesn’t matter much in the playoffs. 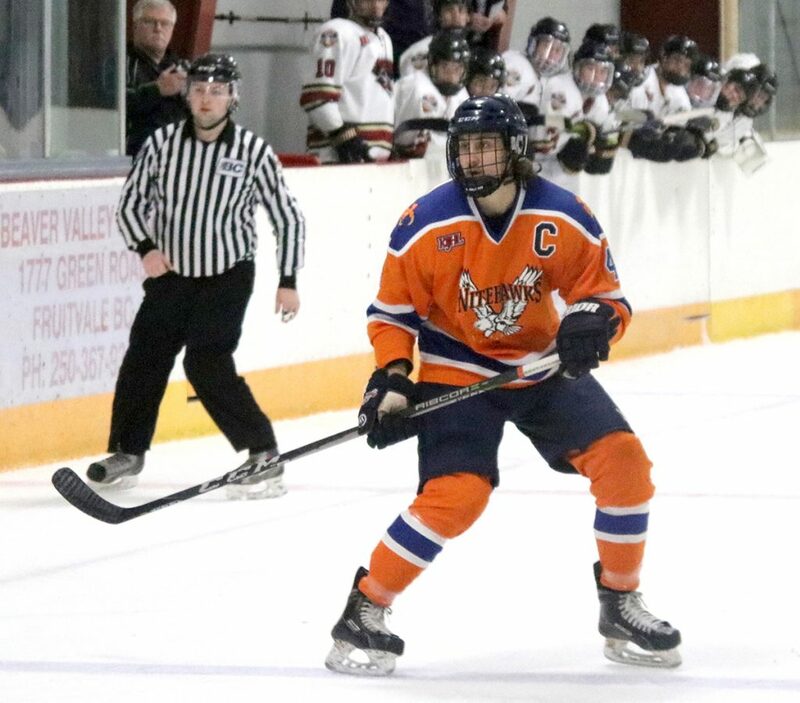 “We struggled against them all year, didn’t beat them once, and we just knew we weren’t going to lay down, we knew we were going to battle as hard as we could,” said Nitehawks captain JakeYuris. 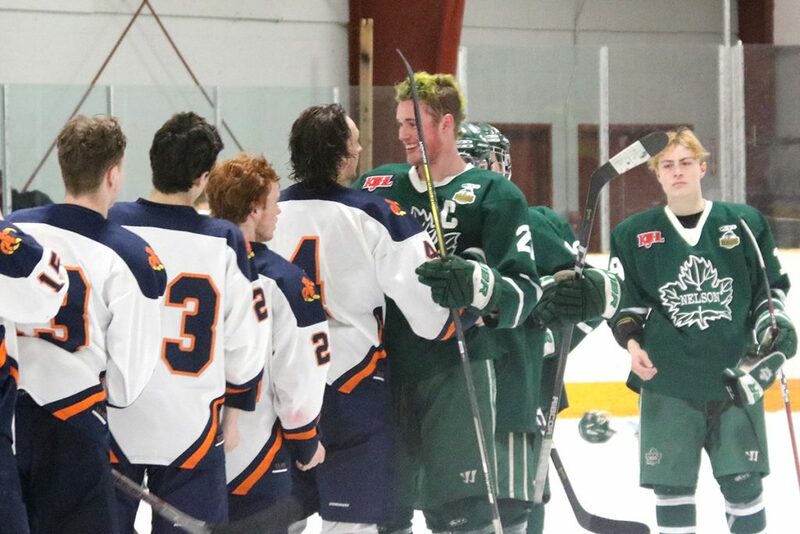 The Beaver Valley Nitehawks defeated the Nelson Leafs 4-1 in a Game 6 victory over the Leafs on Saturday at the B.V. Arena to capture the Neil Murdoch Division title. For the Hawks coach Terry Jones, the roller-coaster season has been an adventure with Jones celebrating his 1,000th KIJHL win in December. 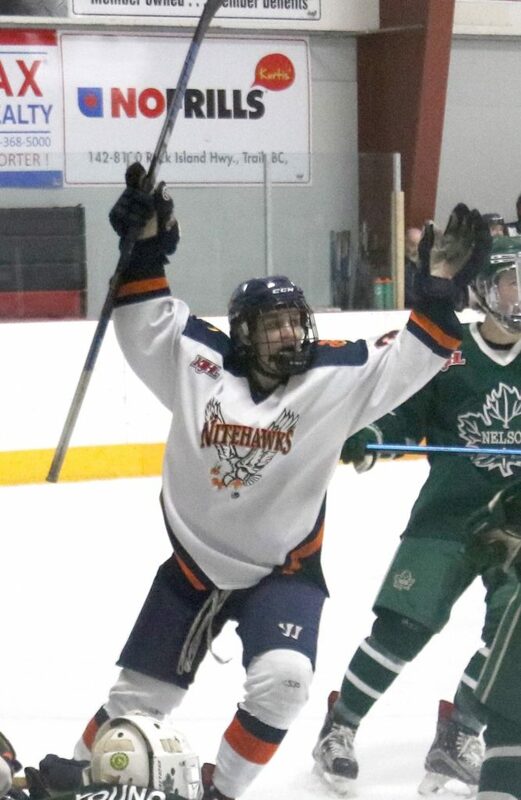 Hawks defenceman Luke Woodrow scored what proved to be the game winner 1:49 into the third period, when his shot from the point sailed through traffic and over the shoulder of Leafs goalie Tenzin Mint for a 2-1 lead. The Leafs were the odds-on-favourite to meet up with the Kimberley Dynamiters in the Kootenay Conference final, but a tough seven-game-series battle against the Spokane Braves took its toll on the Leafs, who played the final two games of the Neil Murdoch final against the Hawks with two affiliate goaltenders. But losing both starting goalies almost proved the Leafs’ salvation. 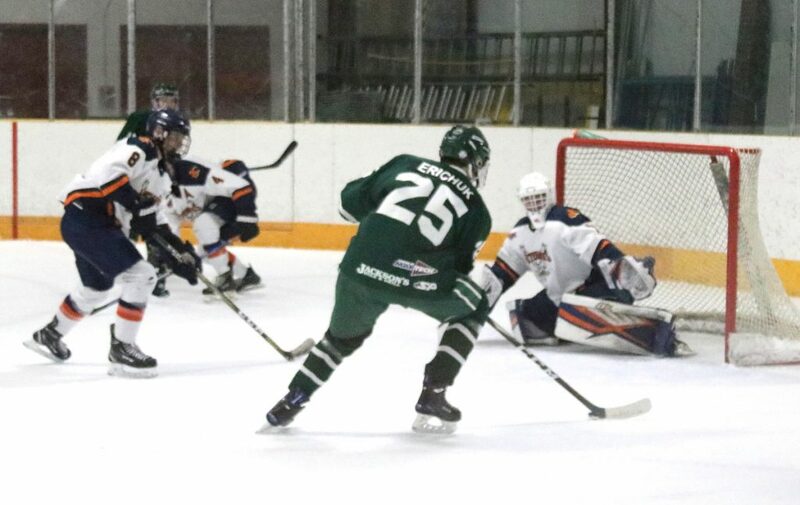 Nelson native Tenzin Mint backstopped the Leafs to a 3-0 shutout win in Game 5 on Friday night, and the 16-year-old Kootenay Ice goalie stymied Nitehawks shooters for two periods on Saturday. Nelson jumped out to a 1-0 lead when Tyler Nypower circled behind the B.V. net came out front, untouched, and fired a shot short-side on Nitehawks goalie Noah Decottignies at 10:38 of the first period. The teams traded chances, and Mint stymied Ryan Crisalli and Brad Ross on breakaways to keep the Leafs on top. But the Nitehawks finally solved Mint at 13:38 of the second period when Yuris set up Michael Hagen in the high slot. Hagen’s shot didn’t get through, but was deflected right to Paul Leroux at the side of the net, who banged it by Mint. B.V. continued to pressure, but the Nelson goalie stopped 15 of 16 shots in the period to keep it deadlocked heading into the final frame. After Woodrow’s goal, Nelson tried to rally in the third, and looked to have scored the tying goal, but the linesman blew the play dead on a high stick, just as the Nelson player put a rebound past Decottignies with seven minutes to play. Less than a minute later Woodrow sent Ross in all alone and the Trail product made no mistake going upstairs over the glove of Mint for a 3-1 B.V. lead. Decottignies was solid, making several big saves in the late going, and Stocks wristed a shot from the slot over Mint’s glove for the 4-1 final. B.V. outshot the Leafs 37-26 and went 0-for-3 on the power play, while the Leafs went 0-for-2. 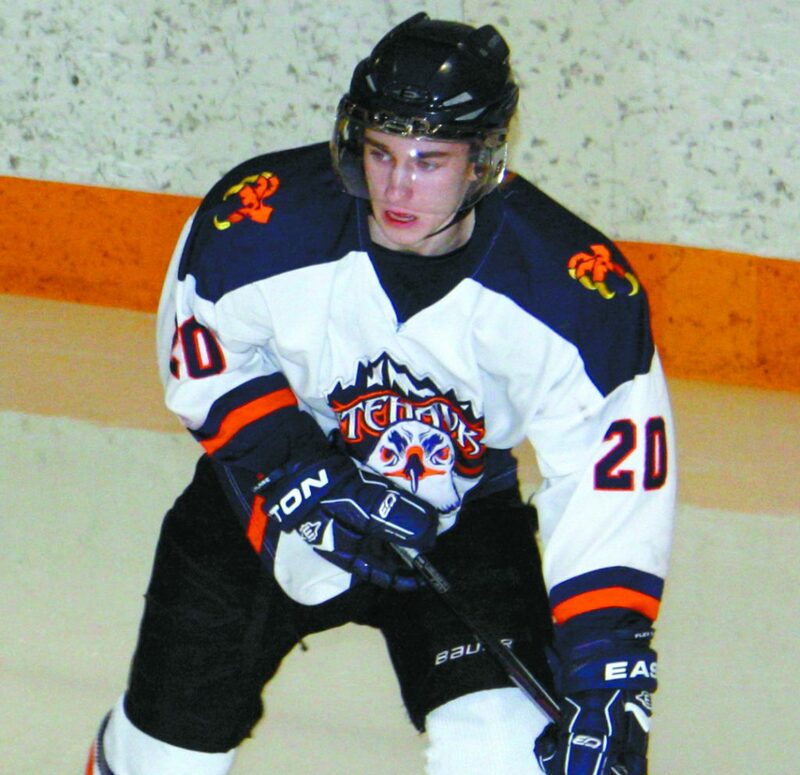 Beaver Valley travels to Kimberley on Tuesday for Game 1 of the Kootenay Conference final.